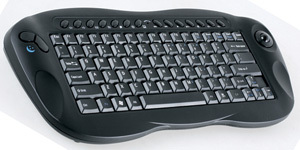 This device offers a HTPC feature with the inclusion of a multimedia keyboard Bluetooth connection. ECS presents a unique solution for those who want to build a HTPC. 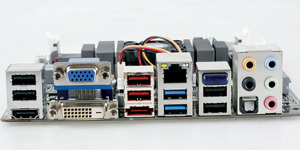 One of the unique offerings that are already installed AMD processors E-350 permanently. So you no longer need to choose the processor itself. However, this causes you can not perform upgrade. Chipset-based Hudson-M1 (A50M), you will find that there are two memory slots that can accommodate a maximum of 8 GB of memory. This product is also equipped with onboard graphics chip ATI Radeon HD6310-based. This graphics chip is sufficient to meet middle needs. In addition, the product also supports DirectX 11 and UVD3 that transfer video decoding process from processor to graphics chip. Using a mini-ITX size is quite small, ECS HDC-I keep trying to present the latest features for modern computing activities. This is evident from SATA3 ports availability (including eSATA). There are also a USB3.0 port and support for both analog and digital output display. ECS HDC-I insert a mini PCI Express x1 slot in area near processor. This slot can be used to accommodate a WiFi card that already bundled in the package. You can just install card and connect cable to an antenna mounted on rear motherboard. Mini slot because it is a consequences physical mini-ITX form that fairly narrow. A somewhat different, also included a multimedia keyboard. The keyboard is smaller than a standard keyboard because it is not accompanied by numeric keys. So layout buttons similar to a laptop keyboard, complete with multimedia keys. Uniquely in left and right sides keyboard is equipped with a handle and comes with a controller like button on a console. Looking at its performance, ECS HDC-I really only suitable for light computing and multimedia activities. If you want to do heavy tasks, such as rendering video or images, may be overheating and the system will be hang. This device allows you to build a practical HTPC. This is supported by completeness features and performance advantages that pretty good. Moreover, the ECS warranty period is fairly long compared to most others. Its designation for HTPC, modern and old port here. There is also a bluetooth dongle for connection to a keyboard. This multimedia Keyboard product are small. However, this keyboard has a lot of extra function keys. All the function keys is quite comfortable to use for all multimedia or gaming activities. 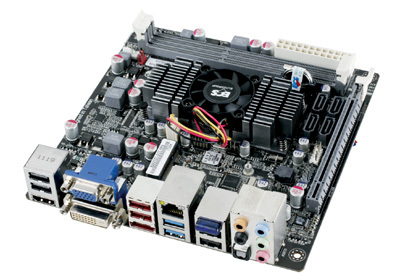 Due to mini-ITX size relatively small, provided a mini-PCI Express slot that serves as a Wi-Fi adapter. Plus: Great for HTPC; already equipped processor; low power consumption; SATA3 completely; have Wi-Fi, Bluetooth and USB3.0; included multimedia keyboard. Minus: Heat when asked to work extra hard; processor can not be upgraded; graphics slot bandwidth is only x4.